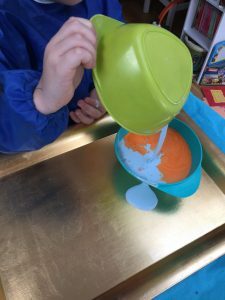 I’ve been wondering about trying oobleck with my preschooler for a while, but he’s not always receptive to new textures so I hadn’t yet taken the plunge. However with my toddler having a good afternoon nap and my preschooler at a loose end I thought I’d give it a go. I should have done it sooner – it was an immediate success! 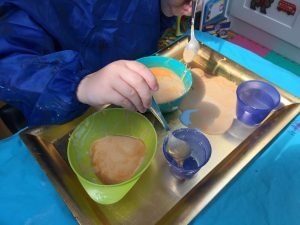 I added 1 cup of cornflour to 1/2 cup of water, with some food colouring (optional) and then added more cornflour until it felt ‘right’. I think there’s a good amount of wiggle room depending on how runny or putty-like you want it. 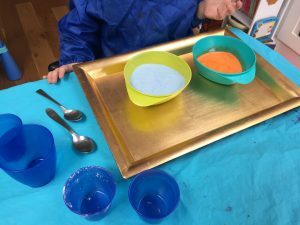 I made two colours – blue and orange – at my preschooler’s request. 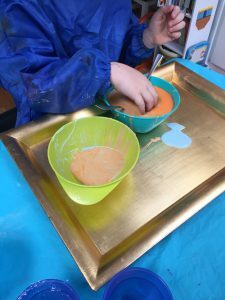 However, the first thing he did was pour the blue one into the orange one and mix them together! Never mind! 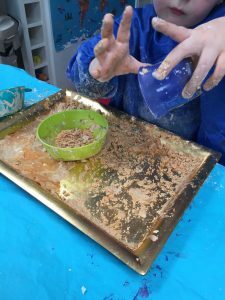 He had so much fun with this, and was even happy to get his hands pretty mucky (a win for us!) – he kept playing until it had dried out. Even then he was happy to clump it together again to see what would happen. I will definitely be doing this again, and trying it out on my toddler!